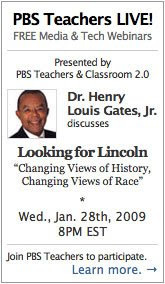 Our first event will be "Changing Views of History, Changing Views of Race" with speaker Dr. Henry Louis Gates, Jr. Dr. Gates will discuss how Americans’ understanding of President Lincoln and African American history and culture continues to evolve, and ways to approach this topic with students. Dr. Gates is the host of the documentary “Looking for Lincoln,” which premieres in February. The program addresses the controversies surrounding Lincoln about race, equality, religion, politics, and depression by carefully interpreting the evidence from those who knew him and those who study him today. To join the event and get the link to the Elluminate meeting room, go to http://www.classroom20.com/events/pbs-cr-20-webinar. All our events are "beginner-friendly," and there are instructions on this page for getting set up to attend. For those outside of the U.S. there is a link to a specific time-conversion page in my comments. Elluminate is helping to sponsor this event by providing the meeting space. For more information on them and their "three for free" web-conferencing solution (VRoom) please visit www.Elluminate.com. I'm an Ed Tech student & I was interested in reading more about Education technology in the classroom & how technology is affecting teachers teaching methodologies as well as student learning. Thanks for the information provided.